Implant supported bridges are similar to a standard dental bridge, but they are supported by dental implants and not by your natural teeth. Implant supported bridges are used when more than one tooth is missing. Implant supported bridges can reduce pressure on your individual implant caused by grinding your teeth. You may need implant supported bridges if you don’t have enough jawbone to support an implant or if a nerve is nearby. The first step in the process is the initial consultation. South Gables Dental will perform a comprehensive examination to review your medical and dental history, take X-rays, and make an impression of your teeth and gums so that a model can be made. If more than one tooth is missing, a CT scan may be given to measure bone loss. The second step is the first surgery. This will either take place in month one if no bone grafting is needed, or month five if bone grafting is needed. We will carefully place the implant(s) in your jaw. The third step is the second surgery. After several months of your implant(s) healing, This surgery is simpler than the first. A small cut will be made in your gums to expose the very top of the implants. A healing cap will be placed on the head of the implant(s). This helps the gums heal correctly. The fourth step is the restoration stage. If a bridge that is restrained by screws is used, the healing cap will be removed and a permanent abutment will be inserted. The abutment will be cut to fit inside a crown. 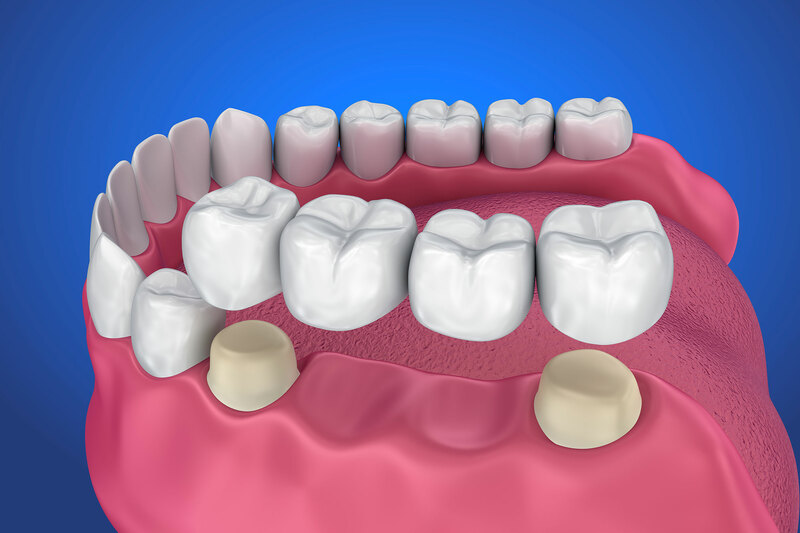 A softer, temporary bridge will be connected to the abutment for 4-8 weeks that will allow your mouth to adjust to chewing. On the next visit, a permanent bridge will be attached. Have any other questions? Call us or make a dental appointment today at our Coral Gables office!